Looking for an ultra chocolatey, ridiculously fudgy brownie? 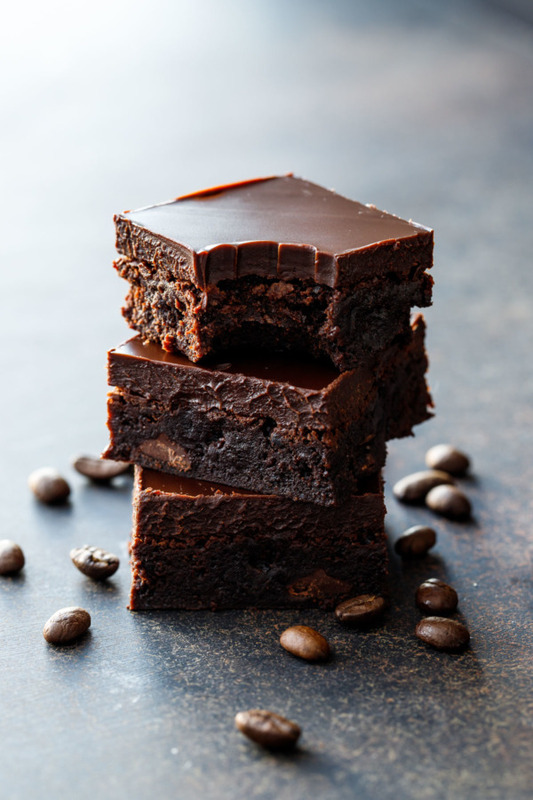 Look no further: these brownies are packed with three kinds of chocolate and a dose of espresso that only deepens the chocolate flavor. I think we can all agree that a silky chocolate ganache topping transforms a good brownie into a great one. 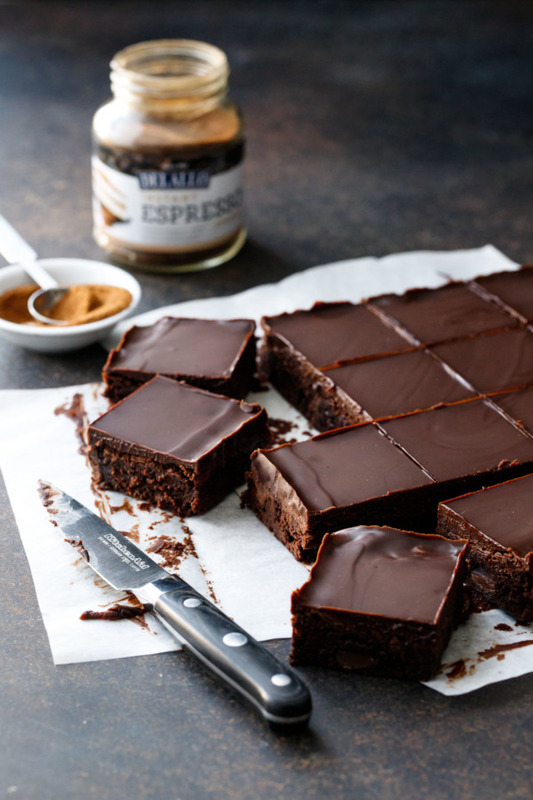 And this brownie recipe is no exception; sure it’d be great without the chocolate espresso glaze, but with it? Well, it’s simply transcendent. Brownies might just be my favorite dessert. More than cookies; more than cakes and even more than cupcakes. Their sheer density is just so dang satisfying. I don’t have one single go-to brownie recipe: a best ever, all-time-favorite brownie that I reach for whenever the craving hits. Instead, I am constantly tweaking and adapting and experimenting, changing the ingredients and proportions depending on the precise circumstances, flavor combinations and toppings being used, and I don’t see that changing anytime soon. This recipe, for example, is very different from my copycat cosmic brownies which in turn are very different from my previous favorite bourbon pecan brownies, and so forth. 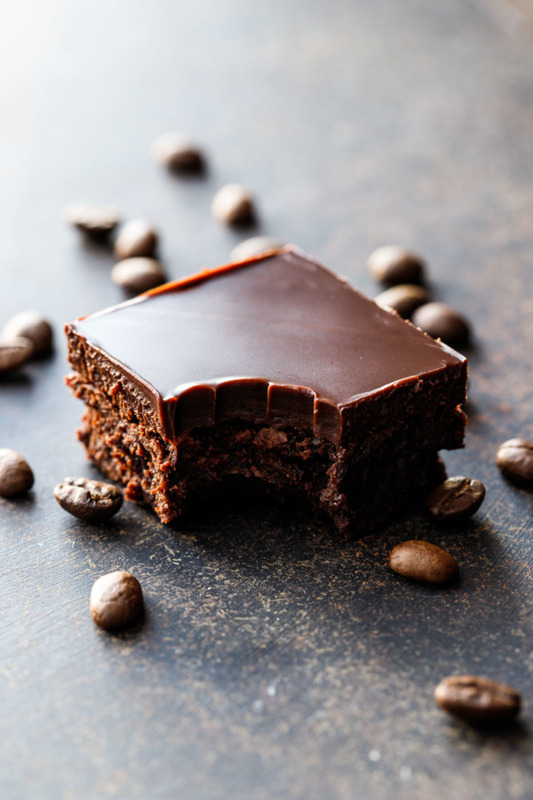 Dark vs unsweetened chocolate, chocolate vs cocoa (or both), baking powder or none… all variations that change the outcome of the brownie, subtle differences that I take advantage of to make the perfect brownie for each unique situation. Simply put, I just can’t settle on a single favorite method, because there are many ways to make a fantastic homemade brownie. I’m determined to try them all. So, yes, these might be my current favorite brownie, the best brownie of the moment if you will. (And my fellow ceramic classmates would agree – they devoured the lot of them and then pleaded for my secret recipe, to which I responded that I don’t believe in secret recipes and I’d happily share). BUT, that said, all the other brownie recipes I’ve made over the past years are still winners too, and certainly shouldn’t be ignored. 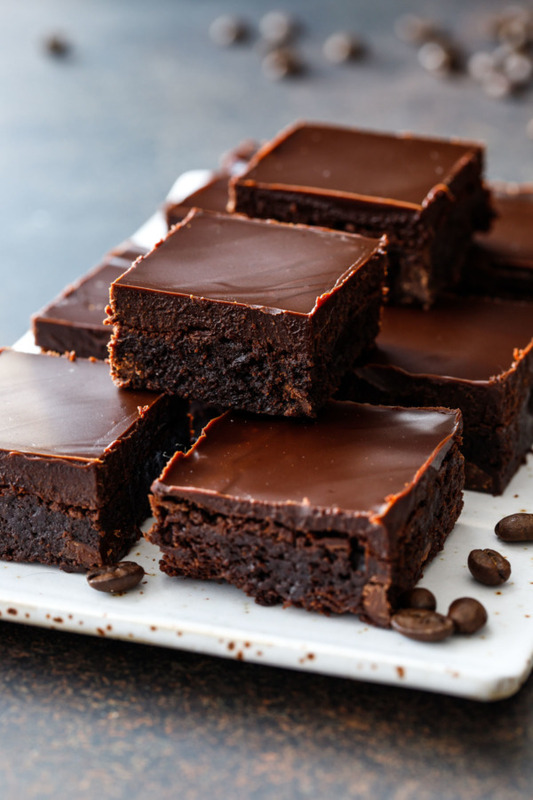 What makes these brownies so incredible is the depth of chocolate flavor, achieved by using three different kinds of chocolate in the brownie (unsweetened, dark cocoa powder, and chocolate chips — ok 4, because there’s actually dark chocolate in the glaze). 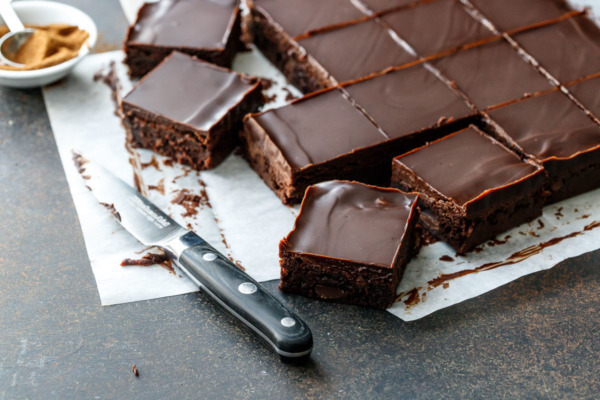 But the real secret to making chocolate brownies taste even more chocolatey? Instant espresso powder. 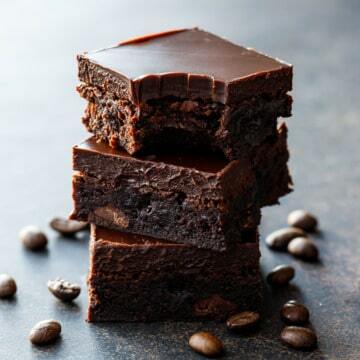 These brownies certainly don’t scream Coffee!, rather, the espresso powder enhances and deepens the chocolate flavor. It’s one of my favorite tricks for chocolate desserts: a pinch or two of espresso powder supercharges the chocolate flavor, making dark chocolate even darker and more robust. Not to be confused with instant coffee, instant espresso has a much more intense flavor and a finer granule that dissolves completely in batters like this one. The thing is, instant espresso powder has always been rather tricky to find. It’s always been hit or miss whether they have it in the coffee aisle at the grocery store. Out of convenience, I’ve always special ordered my espresso powder online. 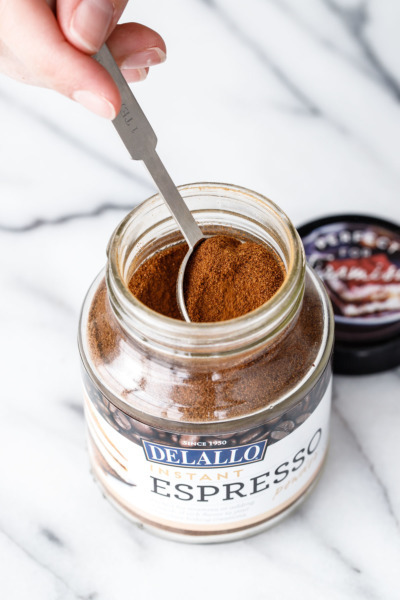 Which is why I was so excited to hear that DeLallo now has an instant espresso powder; you can easily order it online, and chances are you’ll be able to find it in a store near you! The great thing about DeLallo’s espresso powder is it was designed for baking. 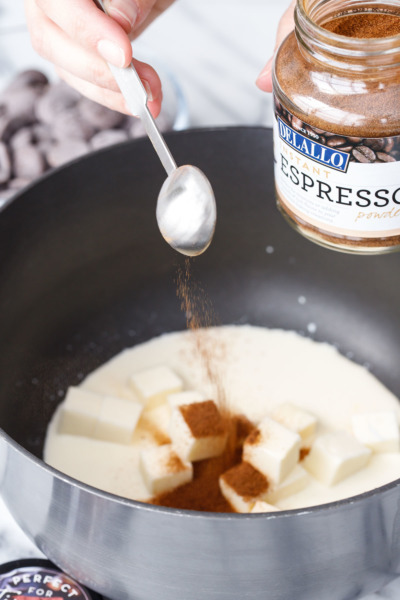 Sure you can use it to make instant espresso, but it was made for recipes like this one. Also, did someone say tiramisu? One jar of this magical stuff lasts forever (or at least a few years, give or take), and I definitely recommend storing it in the freezer to preserve the freshness and flavor over time. Everything you ever wanted in a brownie: rich and fudgy, with a silky smooth chocolate ganache glaze on top. While you won’t feel like you’re eating a shot of espresso, the underlying coffee flavor serves to deepen and enhance the chocolate flavor. Let’s just say, these aren’t one-note chocolate brownies. These brownies have depth. 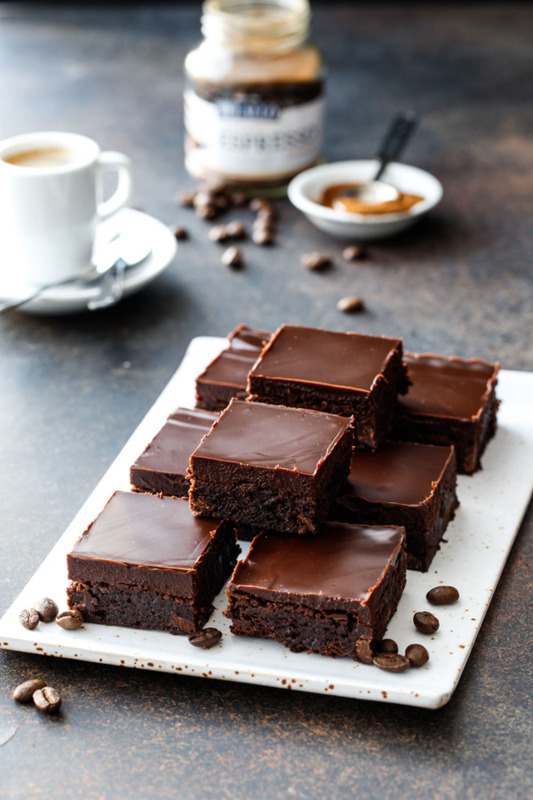 These ultra rich and fudgy brownies are packed with three kinds of chocolate and a dose of espresso that only deepens the chocolate flavor. The luscious chocolate ganache glaze is only the icing on top. Preheat oven to 350 degrees F. Line an 8-by-8 square baking pan with lightly buttered parchment paper. In a medium saucepan, melt butter and chopped chocolate over low heat. Remove from heat and add sugar; stir until sugar somewhat dissolves and forms a grainy paste; batter should be slightly warm, not hot to the touch (you don’t want to cook the eggs). If necessary let it cool another minute or two before adding the eggs. In a bowl, whisk together flour, cocoa powder, salt and espresso powder. Whisk in eggs, one at a time, incorporating completely before adding the second egg. Continue whisking for 1 to 2 minutes until you have a smooth and shiny batter. Whisk in vanilla. Sprinkle over dry ingredients and fold until just incorporated. Fold in chocolate chips. Pour brownie batter into prepared pan. Bake for about 35 minutes or until a toothpick inserted near the center comes out with a few moist crumbs attached. Remove from oven and place on a wire rack; let cool completely (or, even better, let chill overnight for even fudgier brownies). Once brownies are cool, prepare the chocolate glaze. Combine cream, butter, corn syrup, chocolate and espresso in a small saucepan. Stir gently over low heat until chocolate is completely melted and glaze is smooth. Pour over cooled brownies, spreading into an even layer. Lift and bang the pan on the countertop a few times to help the glaze settle and remove air bubbles. Let cool at room temperature for 1 hour, then refrigerate until completely set. 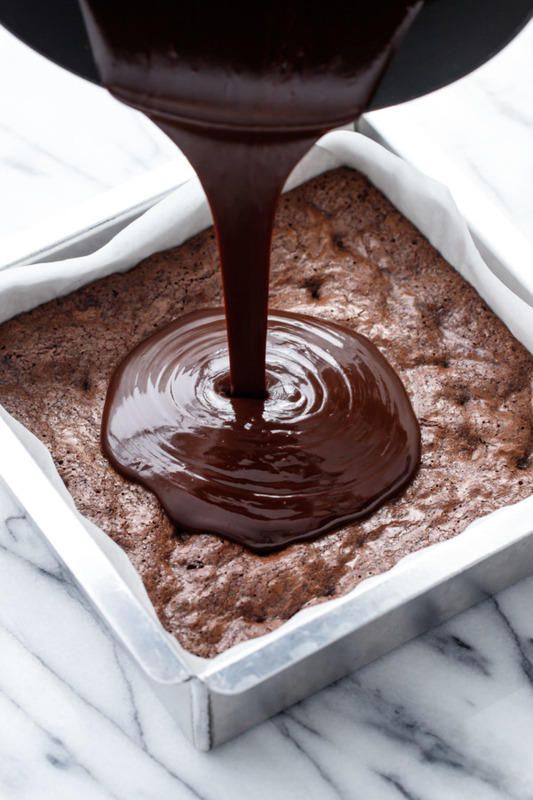 To slice, lift entire block of brownies out of the pan using the parchment paper as handles. Using a large knife, cut into 16 squares, wiping the knife with a moist towel between each slice. Brownies will keep, covered in the refrigerator, for up to 1 week.